Scale dream with a turbo prop power. The Pilatus PC21 is a very successful training aircraft for the military training around the world. It is a Swiss design and flew for the first time in 2002. The airplane went into mass production end of 2004. 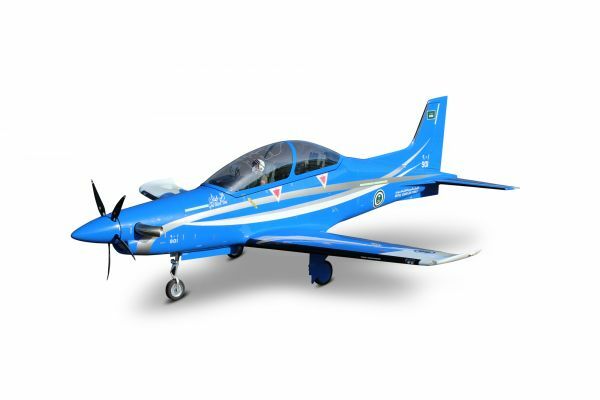 This model replaced a lot of conventional military trainers for the sub sonic pilot training because its trubo prop power system has reasonable cost in operation. Even most reputable training centers like the ENJJPT facility in Witchita Falls, school of most of Nato pilots changed to PC21. And what is more challanging for Tomahawk Design then to come up with a perfect replic of thsi well know aircraft. It is designed beutifully, it offers a very precise level of detial. The surface finishe is state of the art. And the flight performance and the handling is superb. The PC-21 from Tomahawk, a must have with trubo prop propulsion system. An electric power system is in preparation. The PC21 is beuing produced in a vacuum sandwich technology in FRP and CRP. It is built to strength but with the consideration of a maximum of 25kg takeoff weight. It offers a lot of details and is as close to the original as possible. It contains lots of detailed solutions for an easy build up. The access to the engine is very easy through a large hatch. We offer an electric retract system as also an hydraulic scale retract system. The basic kit comes in white. Different base colors as also a full decoration is avaulable on request. We also offer a very detailed cockpit close to the layout of the original. INTAIRCO HOPPER ITRAP 250ML BASIC - XL TYGON New Version 2018 No separat holder necessary any more. Retaining brackets integrated in the top and bottom plate. Related links to "PC-21 2,68 m full composite kit white"